In Alaska, where glamorous game fish abound, some fish are overlooked, or just plain don't get the respect that they deserve. Usually taken incidentally, a by catch if you will, while pursuing other game fish, few trips are undertaken strictly with char as the target species. However, a few years ago I did just that. I travelled to the North Slope with the intention of fishing specifically for char. 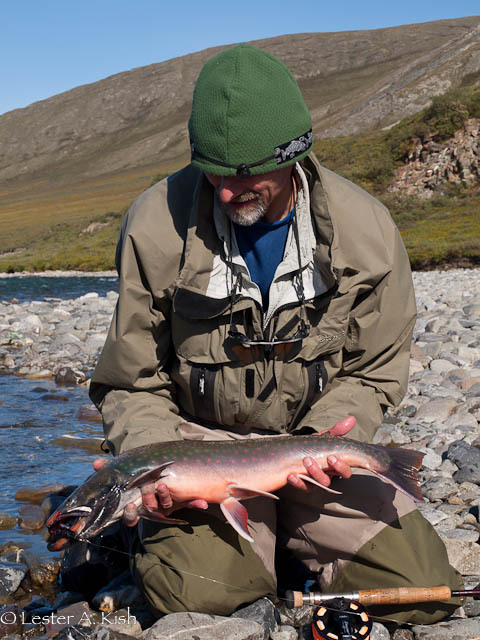 North Slope waters generally lack the various salmon and headline grabbing rainbows. And, while char exist elsewhere in Alaska, it just seemed most appropriate to fish for them in the arctic. After dinner, at our first camp, I strolled upstream with my five weight. Earlier, I'd noted a few rising fish tucked against a rock wall. Expecting grayling, I returned, armed appropriately for trout sized quarry. That's what I got. Nicely trout sized at that. Fit. Fat. Scrappy. They came willingly to a Stimulator. Noting an occasional rise midstream, I rolled out a cast, expecting another grayling. The fly drowned and drifted lazily subsurface. A shadow emerged, then disappeared. Not sure what I had seen, and thinking it a disinterested, albeit large grayling, I cast again. This time the shadow levitated from the seemingly vacant clear water, opened its mouth, and inhaled the fly. All hell broke loose when my grayling morphed into a char that proceeded to race about the pool. The fish pushed the tackle and leader to it's limit. I eventually worked it into shallow water and tailed it. I was pleased, surprised. The fish, not huge, was still nice at perhaps four pounds, bright and silvery. I soon caught another, a little larger, even more spirited. This first encounter prompted me to retire the five weight in favor of the eight and a stouter leader for the remainder of the trip. And a larger fly. A black and blue conehead bugger produced nicely. I found the sporting qualities of these fish to be up there with the best of freshwater game fish. The takes were explosive, on par I believe with smallmouths or steelhead. If they had room to run they did. Some jumped, repeatedly. Another pleasant surprise. No one told me about this. The fish seemed to prefer the head of pools or tailouts. Faster pocket water was barren. The clear water was ideal for sight fishing. Many times I'd strip the fly and a fish would dart from the deeper water at the head of the slower pools. The visual takes were always exciting. The fish ran from three to maybe ten pounds or so. The bigger fish tended to be males, many already starting to show their spawning colors. Few fish are so spectacular. Like a tropical fish in the arctic. Blue-green backed. Red fins with white margins. Spots. Orange bellies. Simply stunning. Of course, then there is the messy question of taxonomy. I'm not a lumper, splitter or counter of pyloric caeca or gill rakers. Char? Dolly? Who cares? Well actually, I do. I went to the arctic wanting to catch it's namesake fish, arctic char and arctic grayling. In my mind at least, I succeeded. Would I do another similar trip? Absolutely. This trip was about seeing the country, hiking and paddling down a remote river. Fishing was an added daily bonus. My only regret is that I didn't skate a muddler in some of the tailouts. I'll write more about this Kongakut River trip in the future. Thanks for the comment. I was aware of the distinction. It makes more sense that a six inch landlocked fish be called a dolly as opposed to a hook jawed ten pound that goes to sea. Perhaps the taxonomists can get busy and do what it takes to initiate the name change. Heck, they re-classify most everything else!